Habit: Annual to shrub. Leaf: simple, alternate; stipules small, tooth- or gland-like; blade entire to deeply lobed. Inflorescence: raceme or spike, generally terminal. Flower: generally bisexual, small, asymmetric, 1 per bract; sepals 2--8; petals 0--8; disk occasionally present; stamens 3--50+, generally on disk, anthers 2-chambered; carpels 2--8, generally fused, generally open distally, ovary superior, sessile or short-stalked, generally 1-chambered, stigmas beak-like. Fruit: capsule, gaping at top, or berry. Seed: few to many, reniform. Genera In Family: 6 genera, +- 85 species: northern and eastern hemispheres, especially Mediterranean. Habit: Annual (perennial herb). Leaf: sessile, entire. Flower: sepals 2--6, margins white; petals entire to shallowly lobed; stamens 3(4); stigmas 3--5. Fruit: capsule. Oligomeris linifolia (Vahl ex Hornem.) J.F. Macbr. Habit: Annual (perennial herb), +- fleshy, glabrous. Stem: erect, < 45 cm. Leaf: 8--45 mm, 0.5--2 mm wide, linear to +- oblanceolate. Inflorescence: bracts triangular to awl-like. 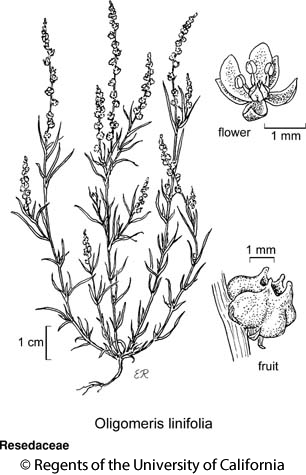 Flower: 1--2 mm; sepals 4; petals 2 (>2), +- white; stamens 3(4); carpels generally 4. Fruit: 1.7--3 mm, 4-parted, compressed-spheric. Seed: black, shiny. Chromosomes: n=24. Citation for this treatment: Thomas F. Daniel 2012, Oligomeris linifolia, in Jepson Flora Project (eds.) Jepson eFlora, http://ucjeps.berkeley.edu/eflora/eflora_display.php?tid=35094, accessed on April 19, 2019. SnJV, SW, D; Markers link to CCH specimen records. Yellow markers indicate records that may provide evidence for eFlora range revision or may have georeferencing or identification issues. Purple markers indicate specimens collected from a garden, greenhouse, or other non-wild location.